Yet again we find ourselves out and about with Ben and Laura! Our friends planned a double date to Boda on Congress Street, a place we had all been talking about going for a while. I must admit, when we got there, the menu was OVERWHELMING–everything sounded amazing. We went on a Wednesday night at 7 o’clock and there was no wait for a table. My husband and I nabbed a prime spot in the front window to people watch and wait for our friends. The restaurant was smartly decorated with benches at the tables instead of the oft opted for back supporting chairs, I will admit after about an hour we were all complaining about our backs hurting, but that was nothing another Singha wouldn’t fix. When our friends arrived, we decided on three tapas plates to share. Ben and Laura opted for the bacon wrapped dates and crispy quail, while Mark and I opted for the pork belly skewers. When they arrived at the table, we got a nice surprise when we received the portabella mushroom skewers instead as our waitress misunderstood what we ordered, but the situation was quickly rectified and we got the portabella skewer for free. The portabella skewer was very meaty and came with a sesame sauce that was killer. The bacon wrapped dates were the clear winner, the juxtaposition of the salty bacon wrapped in the sweet and savory date was unexpected. Everyone agreed they would “definitely get those again.” The pork belly skewer was a bit on the fatty side for me, but was very flavorful nonetheless. The quail looked amazing, but we let our friends dig into that on their own as it was very small, much better for two people to share. I was too busy stuffing my face to take pictures of the appetizer, sorry for my gluttonous mistake. After stuffing ourselves full of tapas, we still had entrees to dive into. 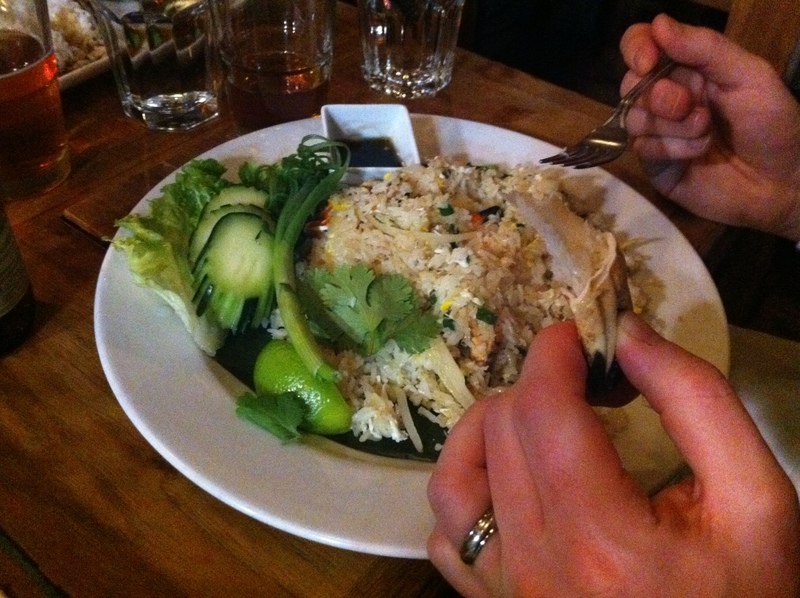 Mark ordered the crab rice, which came with chunks of Joanah crab in jasmine rice. It was a very solid dish, but lacked the fresh crab flavor that one would expect considering we were eating a quarter of a mile from the ocean…I don’t think I would order that dish, but he seemed satisfied. Sorry the pictures are lackluster, I forgot to bring my good camera and was stuck with the good ‘ole phone camera, but you get the gist, right? Laura and I both opted for the Beef Panaeng, which was nothing short of spectacular. 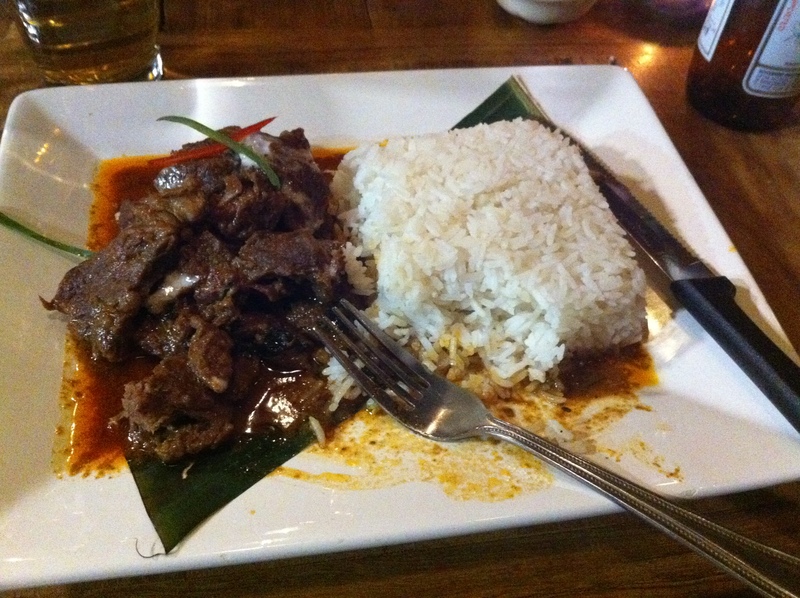 It came with beef from Wolfe’s Neck Farm in Freeport served in a curry paste with coconut cream and a side of jasmine rice. The meat was melt in your mouth tender and the sauce had a nice background hint of coconut milk and peanuts, it was spicy, but mild. I know we both really enjoyed it! Finally, Ben decided on the Pork Hocks braised in Star Anise, which the menu told us is one of the most popular dishes in Thailand! Score! The pork was so tender it came apart easily with a fork, and it tasted great, with just the slightest hint of licorice from the star anise. All in all I thought it was one of the most interesting combinations of spices I have ever had in a dish. I would consider it a must try for anyone. After we all thought we had gorged ourselves to the point of no return our waitress came and asked if we wanted dessert. I already had my mind set when I came in and saw Sticky Rice with Mango on the specials board. I had saved a small part of my stomach all night for it, but sadly they ran out. I will tell you though, if you are ever at Thai restaurant and they are serving Sticky Rice with Mango, EAT IT! Seriously, you will not be sorry. 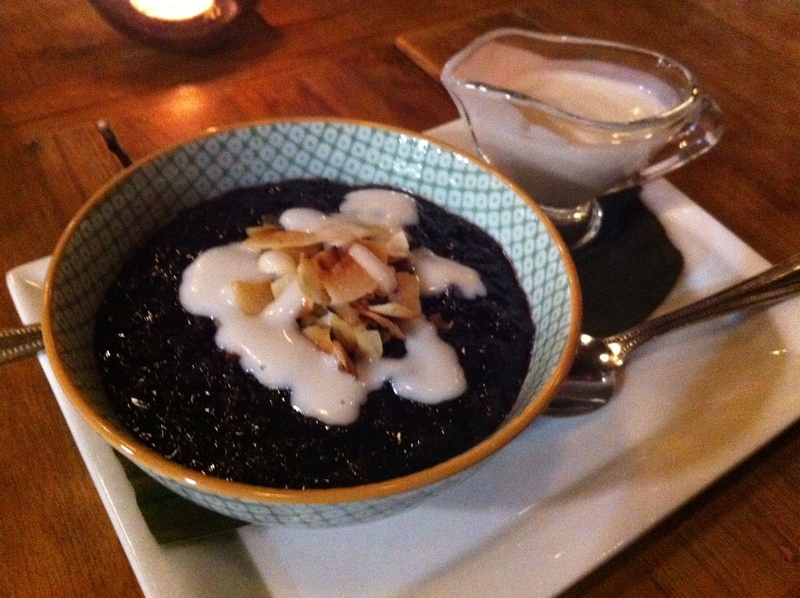 I was disappointed, but instead opted for the Black Sticky Rice Pudding with Coconut Cream. Mark and I shared one and Ben and Laura shared another one. It came out warm with the coconut cream on the side to put as much or as little as one would like. Mark and I, not focusing on the unhealthiness of the cream, opted for dumping it on practically every spoonful, it turned out to be a great decision. The dessert was simple and satisfying–I would have it again. 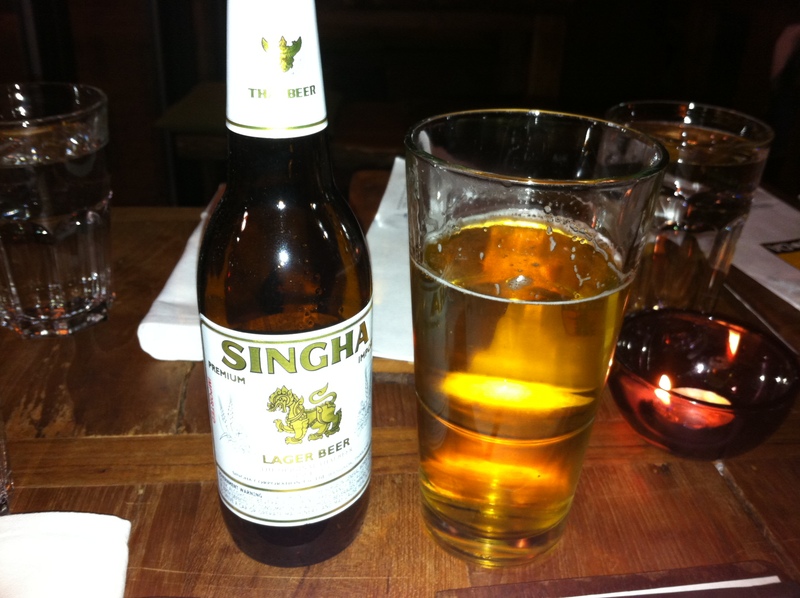 Overall, I felt like BODA was a great choice and would recommend it to anyone who wants to try a Thai fusion restaurant in Portland. It was reasonably priced, with beers, apps, entrees and dessert, we walked out of there spending roughly $60 a couple with tip. Not bad for a delicious mid-week double date with our adorable friends.